My Cat Won’t Bark! (A Relationship Epiphany) is about seeing things as they are in our relationships. It’s stripping away any illusions we may have conjured up and removing unrealistic expectations. It is a primary and primal message of self-empowerment. of decisions and choices we have made. Each of us chooses our own friends, lovers, and spouse. We have the ability to learn from our mistakes and make better choices for ourselves in the future. When we change, our circumstances change. Make with Online Dating, The Recipe for Relationship Happiness, Finding Your Own Way, and much, much more! 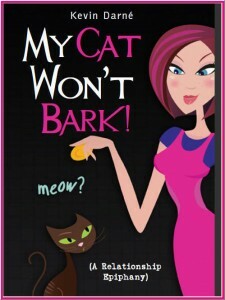 My Cat Won’t Bark! (A Relationship Epiphany) will forever change the way you view and choose your relationships. Darné—a veteran of many long-term relationships and “dating advice examiner” for Examiner.com—distills the wisdom he has gained over the years into this handy and entertaining collection of advice, tips, and maxims. Kevin Darné is the President & CEO of Conation Enterprises; a company that helps people facilitate change within in order to bring about change without. Conation is the part of the mind that drives you to act according to your instincts. These are the natural talents that, when acted on, lead to success and well-being as you use your creative energy to solve problems. Once we have gained wisdom through education and our life experiences we are able to internalize what we have learned to further fortify our instincts. The key to true happiness in life comes with adopting the philosophy: Know yourself, Love yourself, and Trust yourself. Kevin is also a Chicago dating advice examiner for Examiner.com, providing advice and guidance in the tricky world of dating. He also contributes articles and blogs to Hubpages and Yahoo Shine. The primary message within his articles is one of self-empowerment.